Except when barred by one conqueror or another, Jews had lived in Jerusalem since King David. Prior to Jordanian rule in 1948, there was a Jewish majority for 150 years. In 1864, eight thousand of the fifteen thousand population was Jewish. By 1914, two thirds of the sixty five thousand residents were Jewish. In 1948 the United Nations Partition Plan divided the British Mandate of Palestine into two states, one Jewish and one Arab. Jerusalem was to be initially an international city, with access guaranteed for all. This plan was rejected by the surrounding Arab nations, which attacked Israel in concert immediately upon the UN vote. When the truce was declared, Israel had survived, but East Jerusalem(walled Old City) was in procession of TransJordan. The Jordanians subsequently destroyed over 50 synagogues in the Jewish Quarter, which dated back to the 1400's. 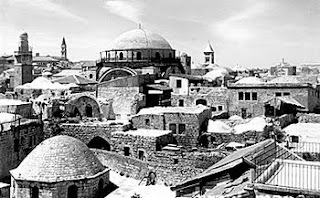 For hundreds of years both Christians and Jews were prohibited from building higher than Muslim structures. The few synagogues which survived were the ones built mostly below street level. 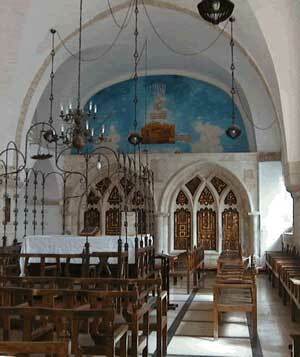 The oldest surviving synagogue, The Jerusalem Synagogue, was built by the Karaite Jews in around 900. Shown above is the Ben Kakai, a Sephardic Synagogue built in the 16th Century. Perhaps the most famous synagogue destroyed by the Jordanians was the Ashkenazi Hurva Synagogue built in 1720, it's dome visible in the top center of this photograph from the 1920's. It's replacement was completed in 2010.